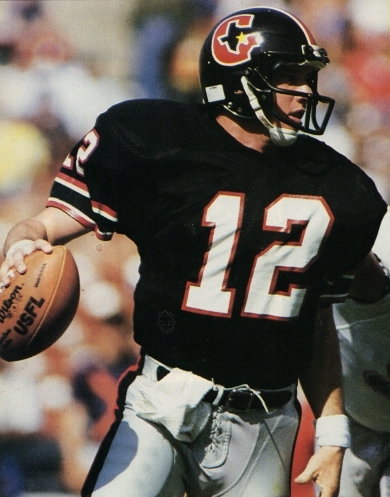 Names like Jim Kelly, Reggie White and Steve Young—all immortalized as Pro Football Hall of Famers—got their starts not in the established NFL, but in an upstart outfit known as the United States Football League (USFL) that lasted only three years (1983-1985) but provided fans not only a football fix from March through June, but stories and memories and innovations that are still felt in today’s NFL. And while Kelly, White, Young and dozens of others went on to success in the NFL, there was much more to the USFL than a training ground for the other league. From an owner swapping an entire franchise of players and coaches (so he didn’t have to make nine, 3-hour plane trips) to an about-to-be-released player punching out his soon-to-be-former coach (and still getting picked up by another team) to an ill-advised (by none other than Donald Trump) move to the fall and ensuing failed lawsuit, the USFL was replete with tales of the owners, players and officials who made up this crazy experiment, all chronicled in great detail in the new book Football for a Buck: The Crazy Rise and Crazier Demise of the USFL (Football for a Buck: The Crazy Rise and Crazier Demise of the USFL (Houghton Mifflin Harcourt, 384 pps) by former Sports Illustrated writer Jeff Pearlman (click here for our earlier Q&A with Jeff). In Football for a Buck, Pearlman recounts one unreal story after another with reporter’s detail, unearthing 35-plus year old facts through extensive interviews and documents. It’s a league that had great intentions, and even what seemed like a solid business plan: cost-controlled rosters, underserved football markets and a fun approach to the game (two-point conversions! replay challenges! ), the antithesis of the “No-Fun-League” status the NFL had attained. And when Herschel Walker, the Heisman Trophy winner, took the unprecedented step of foregoing his senior year at Georgia to sign with the flagship New Jersey Generals (not yet owned by Trump but by Oklahoma oilman J. Walter Duncan), the sports world took notice. This spring league was serious. Just as the talent level of players varied greatly, the abilities of owners and coaches was similarly disparate in the league. This provides fodder for some of the best Football for a Buck stories, the incompetence often as ridiculous as seemingly unbelievable. And the league’s final death knell—its antitrust lawsuit “victory” over the NFL that earned the league a single dollar, trebled to $3, put the depravity and lack of control of the dominant league owner, Trump, on full display. While the league was struggling and future success was far from guaranteed, Trump’s actions made for great copy in the book but hastened its trip to the scrap heap of failed sports leagues.